After graduating from YHS, Class President Natalee Sinclair ’06 attended the University of British Columbia earning a Bachelor of Sciences (BSc) in Life Sciences and a minor in Commerce. When she wasn’t participating in Phrateres (a philanthropic-social organization for female university students) or playing on the varsity ultimate frisbee team, she worked for Buntain Insurance Agencies Ltd., a family-owned insurance brokerage. Focusing on personal insurance, she remained with Buntain, acting as the Personal Lines Manager, until 2013. Natalee transitioned to a larger national insurance brokerage, Jones Brown Inc, where she concentrated exclusively on high net worth clients. She has been involved in giving back to the insurance community by acting as the Vice-Chair for the Seminar Committee of the Insurance Institute of British Columbia, responsible for creating and delivering insurance-related seminars for industry professionals. 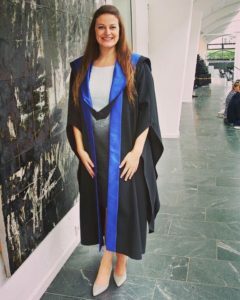 Recently, Natalee successfully completed her full-time Masters of Business Administration (MBA) at Copenhagen Business School (CBS). Upon returning to Vancouver, she accepted a position as manager for strategic projects with Jones Brown. Natalee is currently working as the Project Manager for the Policies and Procedures Manual (PPM), utilizing her 10 years of experience in the Property & Casualty insurance industry and recently acquired MBA toolkit to develop materials and resources, and to deliver training and coaching presentations to over 150 employees across Canada. In her free time (which is limited), she enjoys ocean swimming, golfing, competitive women’s volleyball and ultimate frisbee, reading lengthy fictional epic stories, travelling around the world, and immersing herself in Scandinavian culture, language, and food.